Half day workshop (2 hours) These should be within a 30 mile radius of Crowborough, E. Sussex. 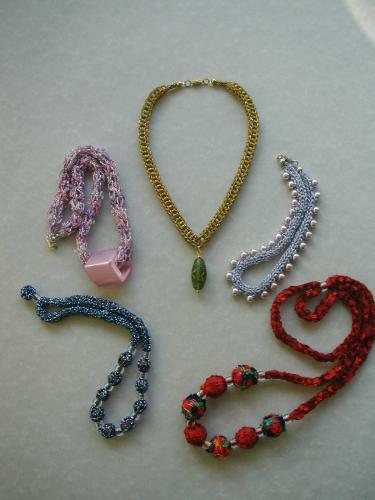 "Get Stuffed and Knotted" - creative uses of knitting ribbon, "Beaded French Knitting" - learn 4 different beading techniques, "Be a Designer" - make your own beads - make beads mainly from recycled material. One day workshops : distances negotiable. 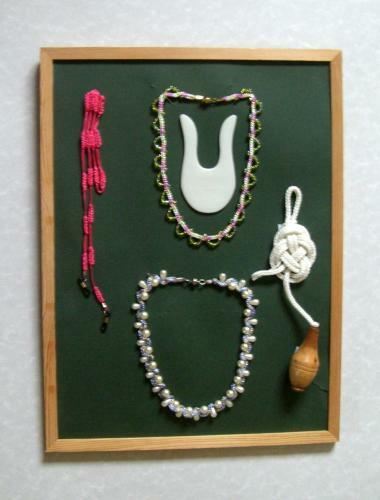 "Kumihimo", "The Lucet", "Fill the Gap", - these will all progress to the incorporation of beads. Also included "Ply-split Darning", "Temari - Japanese Embroidered Balls"
Two day workshop "Cords and Tassels"
One day workshop. You organise the workshop and I come to you. 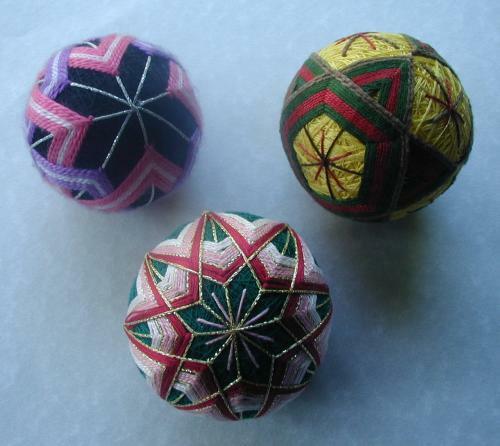 You will learn how to wrap a polystyrene ball in preparation for embroidering; how to mark it into even sections and then embroider with simple stitches to produce one of the balls illustrated (these were made by the Ulster Embroidery Guild at a workshop). If you are interested, contact me for further details. Two day workshop. 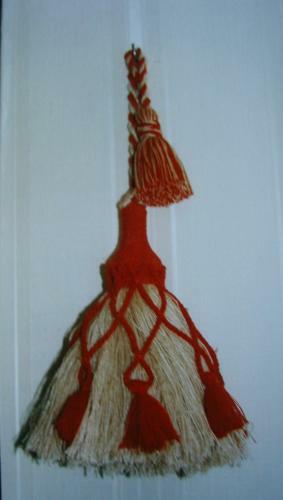 It involves making professional looking cords and a variety of simple tassels as well as making a tassel with a wrapped head (see picture - again, the result of a two day workshop). Half day workshop In addition to looking at the uses of stuffed knitting ribbon, you will be able to make one of the items shown and see how to make the others and take home the materials and instructions for them. Half day workshop. In this workshop you will learn four different beading techniques, enabling you to create stunning jewellery and accessories. 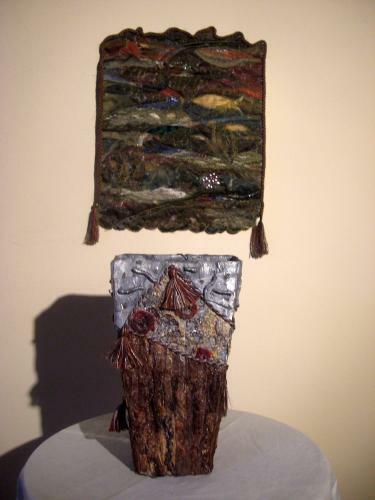 You will also be introduced to a variety of creative uses for a craft many of you will have learned as a child. Half day workshop. 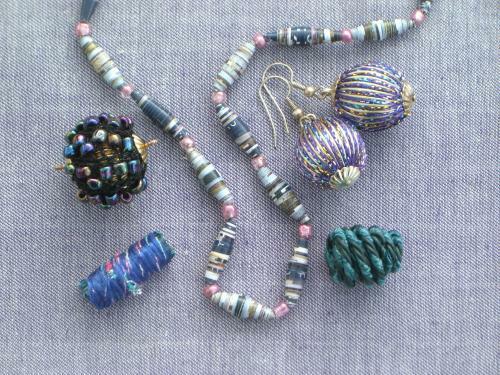 Here you will create beads from paper, scraps of material, wire, fancy threads and more. Once you begin to explore, you will come up with your own ideas. 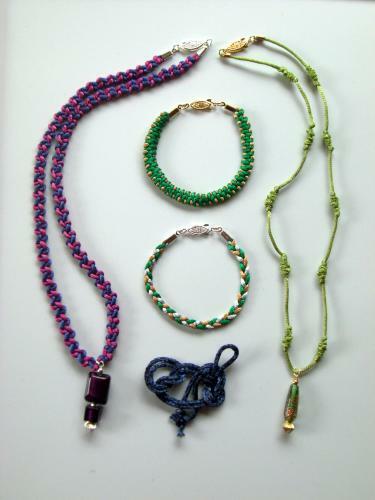 One day workshop - In this you will work a "Kongo Gumi pattern before starting either a beaded bracelet or necklace. You will have the opportunity to try a variety of patterns and explore a variety of uses. Exploring "Fill the Gap" - a straw plaiting technique. One day workshop. In this you will learn the basic technique (5 yr olds can do it with ease!). 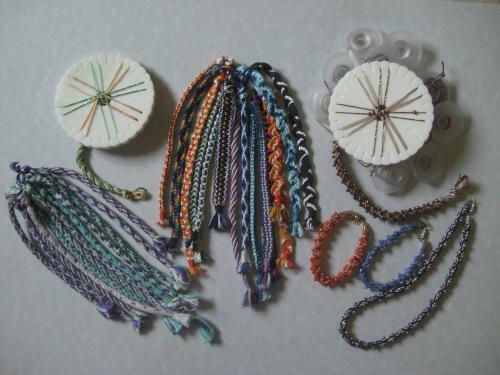 You will then progress to making a beaded bracelet. We will also explore the many variations and uses possible. You will also be able to try the "Laramie" braid developed by Shirley Berlin - an exciting development. One day workshop. Lucetting is an ancient craft dating back to Viking times and practised across Europe, Africa and Asia In this workshop you will learn the basic technique. 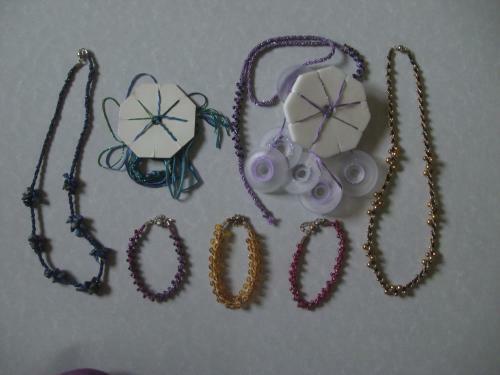 You will then progress to starting a beaded bracelet. "Braids around the World", "Braids for Embelishment" and "World Textiles" In each case I will have samples to handle and for the braid talks will incorporate short demonstrations. 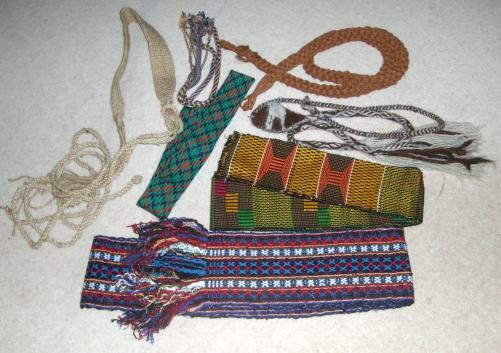 There will be the opportunity to purchase braiding kits at the end of each talk. For more details use the Contact Form. As well as introducing many different types of braiding from around the world, I will examine ways of incorporating them into other disciplines such as patchwork and embroidery. 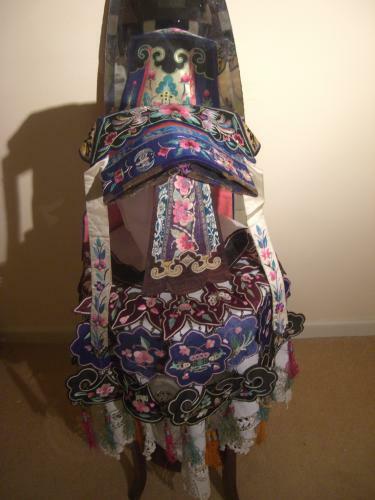 We will then look at their creative use in fashion and furnishing. The talk will be enhanced by the opportunity to handle and examine illustrative examples. Follow me in my adventures into braiding, and share an exploration of many different braids and their uses. See and examine many braids I have collected in my travels Ireland to Peru; Nepal to Ukraine and many countries in between. See the development of braids from Viking times to the present day and explore their potential for yourself. I have been privileged to travel fairly extensively around the world and have collected a number of items on my travels. Other items I have acquired over the years. In this talk I will share these with you and explore some of the background and traditions attached to them. I would also be happy for others to share one prized textile from abroad with something of its background.